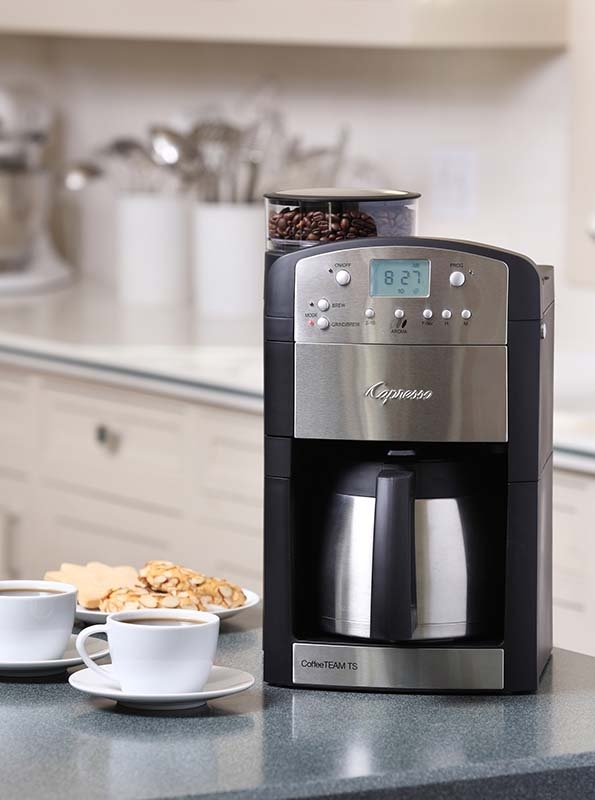 The Capresso CoffeeTeam TS is a programmable 10 cup coffee maker. It features a stainless steel thermal serving carafe and a built in conical burr grinder. Capresso Coffee Team TS - Programmable coffee maker with coffee grinder. Exclusive direct feed technology. Just pour in the coffee beans, program the machine and Capresso Coffee Team TS with thermal carafe does the rest... automatically grinding and brewing the most delicious coffee at any time you want. The CoffeeTEAM TS uses the same solid steel conical burrs as found in high-end automatic coffee centers. The slow grinding of the burrs imparts minimal heat, preserving more aroma than blade grinding for a finer, more uniform grind. 50 oz. stainless steel thermal carafe keeps your brew hot and fresh for hours. 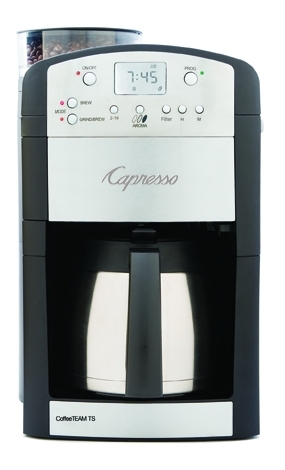 This is our third or fourth replacement of this coffeemaker ever since this model was introduced. It is used at least once per day, often twice - it consistently makes excellent coffee, is extremely fast and simple to set up and lasts a long time. We have tried other coffeemakers and none can compare. This is my second which will to be used in my Summer cabin! Coffee stays hot but wish it was a 12 cup instead of a 10 cup. Didn't like the reviews on the new 12 cup version. Perfect tasting coffee every morning. Easy to program, worth every penny! Great All in One Coffee Maker! Select your beans, to fit your taste! can I get a replacement or even buy a stainless steel one as a replacement ???? A: Yes to both questions. Either container can be purchased directly from Jura Inc. Customer Service #is 1-800-767-3554. Programmable Clock/Timer -Wake up to a full pot of coffee. Professional programmable conical steel burr coffee grinder. Slow burr grinding imparts minimal heat, preserving more aroma than blade grinders. Offers five coffee grind fineness settings for light to dark beans; five cup size settings and three strength settings. Exclusive direct-feed technology, the coffee filter stays inside the machine during grinding, preserving aroma and reducing mechanical movement. Unlike other grind and brew coffee makers, the Capresso Coffee Team TS separates the grinder and brewer keeping moisture away from the grinder. Just before brewing, the grinder is automatically sealed off to keep steam and moisture away from the conical burrs. 6 oz. bean container capacity. Charcoal Water Filtration System removes chlorine and other impurities, one filter included. Automatic indicator for when to replace water filter. Stainless steel 10 Cup thermal carafe keeps the coffee hot for hours while maintaining taste and aroma. 2 Hour Safety Shut-Off, automatically turns coffee maker off.